Houston, TX –Early Voting for the May 5, 2018 City of Houston Council Member District K Special Election begins Monday, April 23rd. 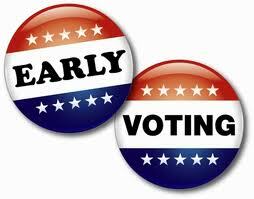 The Early Voting period for this election cycle runs thru Tuesday, May 1st. In Harris County, four sites will be available for 86,000 District K registered voters to cast a ballot in person before Election Day. The Early Voting locations include, the Harris County Administrative Bldg. (1001 Preston, 4th Floor), Fiesta Mart (8130 Kirby Dr.), Hiram Clarke Multi-Service Center (3810 W. Fuqua St.), and Platou Community Center (11655 Chimney Rock Rd.). · April 23 – 27: 8:00 a.m. – 5:00 p.m.
· April 28: 7:00 a.m. – 7:00 p.m.
· April 29: 1:00 p.m. – 5:00 p.m.
· April 30 – May 1: 7:00 a.m. – 7:00 p.m. The majority of Houston Council District K is located between Brays Bayou and Almeda in Southwest Harris County. However, a portion of District K which comprises a fifth of the electorate is located in Fort Bend County. District K registered voters residing in Fort Bend County must contact the Fort Bend County Election Office for information regarding the May 5th Election. Aside from the City of Houston election, over 70 political entities in Harris County, including school, emergency, and utility districts, are conducting an election on May 5th. “While my office is only conducting the City of Houston Council Member District K Special Election, all Harris County registered voters may visit www.HarrisVotes.com to determine if they reside in one of the 70 jurisdictions that are holding an election on May 5th,” informed Stanart. For more information about the May 5th City of Houston Council Member District K Special Election and the May 22nd Democratic and Republican Primary Runoff Elections voters may visit www.HarrisVotes.com or call the Harris County Clerk’s office at 713.755.6965. Voters may also visit the website to determine if theyare eligible to vote in an upcoming election or review the list of acceptable forms of identification to vote at the polls. You can see the map and schedule for Harris County, which is to say District K, here. Fort Bend County voters, including those in District K, you can find your early voting information here. The District K special election is the only election being conducted by the Harris County Clerk. There are some local elections being held in Harris County, including Deer Park ISD and Galena Park municipal elections. There’s just one race for Deer Park ISD, and you can find information about that here, including a nice profile of candidate Monique Rodriguez, who has the endorsement of both the Harris County AFL-CIO and the Area 5 Democrats. For Galena Park, that information can be found here. I know nothing about those candidates. A little farther out, the city of Pearland and Pearland ISD have regularly scheduled elections. Here’s the information for the city of Pearland and for Pearland ISD. These elections are being conducted by the Brazoria County Clerk, so early voting information for each can be found here. One candidate in each race has been Texas Democratic Party: Dalia Kasseb for Pearland City Council Position 4 – she fell short in a runoff for Council last year – and Daniel Hernandez for Pearland ISD School Board Trustee Position 4. There are also elections in Friendswood – a list of candidates there and in Pearland is here – but as with Galena Park I know nothing about any of them. There are other elections around the state, as well as the special election in HD13 featuring Cecil Webster. I suggest you check with your county clerk or elections administrator if you’re not sure if there’s a reason for you to vote. Hot on the heels of this are the primary runoffs, on May 22, so if you’re not voting now you’ll be able to soon. What are the elections of interest this May?